Apologies, this one is a little late. Day 7 was a long one. 19 hours in total that started with a 3am alarm and a mountain hike... understandably we fell slightly behind schedule with other tasks in hand, i.e. the blog. So, from the start... We had to be in the osprey hides before sunrise (4:30), so we got up this morning at 3am. Neil, Claire, Me, Rose, Lewis and Evie were scheduled to be in the hides today, the other half of the group tomorrow in order to maximise our combined chances of seeing the ospreys. As you can see below, by the time the sun rose spirits were high and we were full of optimism. We had been briefed by the rangers and had been told that if we moved our lenses before the bird hit the water then we could spook it and potentially cause it to bail on it's dive. So, we had to wait for the moment that the osprey dived before we framed up and tried to quickly get our focusing right at which point we might have a second or two before the bird flew out of shot. However, the ospreys did not play ball... Rumour has it was that they had feasted the evening before which could explain their reluctancy to dive in the morning. It didn't take long for the hide to become a cold sleepy place for us all. We sat (quietly for the most part) in our hide from 4:30am - 9:30am. At which point Craig, the hide ranger at Rothiemurchus (whom Evie might have developed a slight crush on) told us that any hope for morning activity was gone. He invited us to go back at 4:30pm after the site closed to hopefully see the birds come in for an evening feed. We left slightly disheartened after having invested so much hope, effort and a little money into potentially seeing the ospreys. From there we got picked up by the rest of the squad, we went into Aviemore for a cooked breakfast and coffee before heading to Cairngorm mountain. We hiked up Cairngorm as a team, once we reached the bowl the group fragmented, ready for everybody to work on their own thing. Rose and Neil worked on some combo 360º and classic tracking rail timelapse. Neil set up his tracking rail over a stream which would gradually reveal the peak above the bowl. Rose set her GoPro Fusion camera up on top of Neil's DSLR so it would create a similar timelapse but in 360º. George set up anther timelapse further into the bowl, as did Evie. The rest of the squad hiked right up into the bowl where we scrambled across boulders and even found ptarmigan. As most of the snow on the mountain had melted by this time of year the ptarmigan had also begun to change out of their white winter plumage and begun to settle into their brown speckled summer colours. It was incredible to see the way that the ptarmigan's colouration almost perfectly matched its surroundings. They adapt across the seasons, in the winter the bird is almost pure white to blend into the snow, in the summer it is white and speckled brown much like the exposed earth and rocks of the mountain and in the autumn it becomes speckled grey as the landscape dulls. We spent 5 hours or so on the mountain in total before we had to race back down to get back to the osprey hides for 4:30. As we had returned after the site had closed this time we had no ranger telling us over the radio where the birds where. So Neil stepped up and stood between the hides with his binoculars and kept a keen eye out for any movement in the sky, ready to dive back into the hide and hopefully get some shots too. It wasn't long before three separate birds came in for a look around the area, but soon dispersed again. Neil saw one return and we all got ready, but nothing could have quite prepared us for the moment when the first osprey landed in the water in front of us. There was an excited panic as we hoped that we managed to get a photo in the blink of an eye that the bird was there. I think its safe to say that most of us slightly missed the mark on the first dive. But fortunately, it was unsuccessful and we got another opportunity within a minute or so after we had adjusted out settings to compensate for the bright but beautiful evening light. Over the next few hours we were treated to a total of 6 dives and 3 successful catches. From those dives we all got shots that we were happy with and memories that I don't think we'll ever forget. I'll leave this one with some osprey shots from Evie, Claire and myself. Hope you've enjoyed reading, X. This morning's early birds were Eleni and Angharad who got up to the red squirrel hide at 4:15. George and Rose slept in today so didn't make it out for the morning minibus safari with our Mark. So the Cairngorms by minibus tour this morning was just Mark and Pip, they were treated (much to George and Rose's dismay), they saw two owls, a tawny and a short eared... The tawny was too quick for them but Pip managed to get a few good shots of the short eared owl! 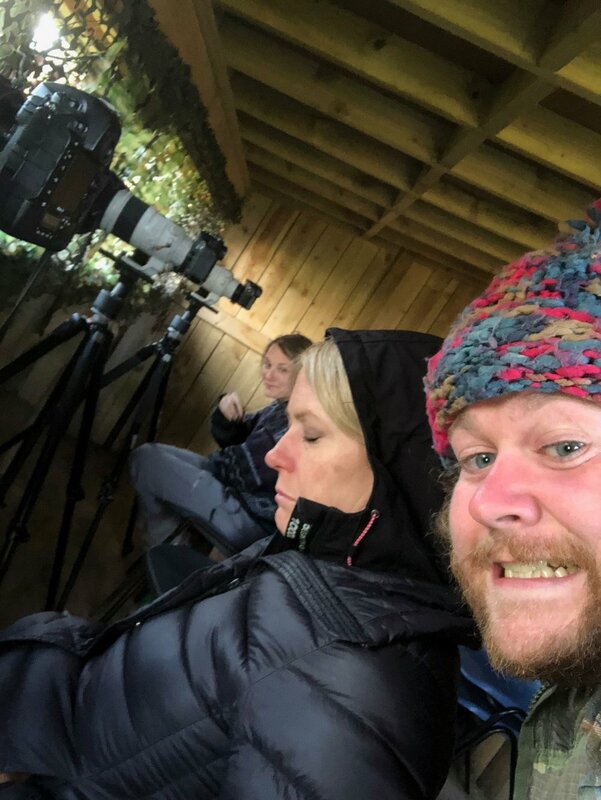 Yesterday Neil ran a camera trapping workshop, he set up a camera trap in the area where we know the red squirrels frequent, he talked us through the setting up of triggers and how to correctly set exposures for the environment and use external flash to light the subject. We left his camera trap for about 8 hours and got some really cool wide angle shots of the red squirrels. Once we all reconvened we set off for Garten woods next to Loch Mallachie and Loch Garten. The woods are one of the last remaining examples of an old growth forest indicative of the natural British landscape. Joe Gray - Garten Woods. Whilst there we split up and Neil ran another moving timelapse induction using his Syrp Genie set up. Rose got a lovely timelapse of the light moving through the woodland. We've got an early start tomorrow, setting off for the ospreys at 3:30 so hopefully we'll have a nie selection of osprey photos for you tomorrow evening! Like every other day there was a group of hardcores up in the wee hours, this time it was the turn of Evie and Neuza to visit the red squirrel hide, as always Neil was up with them at 4 to help set up and give advice before the squirrels turned up. Resident early birds George and Mark were joined by Alisatir, Rose, Ang and Lenny... And a strange talking bush for their morning minibus safari. You may not be able to see Lewis in these photos but I can assure you that he is in there. After everybody got back to Easter Corrie we prepared for our road trip to Chanonry Point. I don't think anybody really knew what to expect from the day, we hoped to see dolphins but none of us had even dared to dream that we would experience them in the way that we did. This morning it was the turn of Claire and Rose to get up at 4am for the harsh slog up the steepest hill in Scotland in the rain with telephoto lenses and hides to sit in the woods in the hope of seeing red squirrels... Again, Neil was good enough to get up with them at 4 to help set up their hides as well as GoPro set ups. This time though they set up Rose's GoPro Fusion 360º camera. Good news is that the Squirrels arrived and they got some amazing photos and footage... the 360º footage takes about a million years to stitch and render though so we'll have that with you as soon as we can! Our resident early bird George has been getting out every morning with Mark at about 4:30 for our Maaarks minibus safaris. It's been paying off as he seems to come back every day with a few more photos... Today he saw red and black grouse and managed to snap a deers bum as it hopped the fence away from him. Tomorrow looks like George and Mark are going to be joined by a group of others all keen to see some more of the local wildlife. We worked on some classic portraiture and Neil showed us how to use backdrops and off camera flash in the field which was fantastic. Evie was particularly happy with this workshop as it directly links to photographs that she is aiming for within her equestrian work that she loves. Here are a selection of photographs sent over by the guys from today. Rose spent the day working on some 3D photographs of the owls... so if you have some 3D glasses in a cupboard then dig them out and have a butchers at this!!! Lewis and myself had an early start this morning, Neil was kind enough to join us at 4am for the walk up into the woods behind Easter Corrie, and helped us set up for a sunrise red squirrel shoot. He planted a remote GoPro next to a tree stump that Lewis was able to trigger from the hide. He also helped us set up the hides and gave us some pointers before leaving us to the shoot. The squirrels were ready for breakfast just after 5am with one or two persistent ones sticking around until just after 8:30, this gave us a decent chance to get some stills and video footage. We'll upload some of Lewis's stills soon. but for now heres a short video sequence that I shot on the Panasonic GH4 & Canon 300mm 2.8ii. A short red squirrel sequence I shot this morning. Music: Arcade Fire - Song on the Beach. Whilst we were up in the woods watching the squirrels Rose, Alistair and George went with Mark on a Scottish minibus safari. They saw grouse, deer and mountain hare from a distance which can't be sniffed at for a hour or so drive around the estate. After we all got back from our morning exploits we took a squad road trip to Loch an Eilein. There Neil inducted part of the group on tracking rail timelapse techniques using his Sryp Genie setup. Mark took a group to the other side of the loch to show us how to use the Gigapan. Then we all spent a few hours shooting landscapes and timelapses. Claire getting serious about her timelapse. Timelapse from opposite side of the loch by Neuza. Cairngorms MNHP 2018 - Arrival. The drive is over, now the journey begins... (That might be the cheesiest thing I've ever written). I'm going to keep this one fairly short as it's a later than planned and we've only just got into the cottages for the night. Lewis and myself have got a pretty early one tomorrow, first two in the red squirrel hides at 4am... Rose, Alistair and George are off with Mark to hopefully see some grouse, deer and lapwings... and whatever else they manage to see along the way. It was a tame journey to be honest, we had a stop to fully absorb the sadness of an old dilapidated Little Chef opposite the shiny ambassador for the new world that is Subway. Then we moved on to The Falls of Bruar where we spend a few hours taking photos and shooting a little video. Lewis saw his first red squirrel of the trip and we stumbled across a roe deer in the woodland. There was plenty of opportunities for landscapes and long exposure shots of the waterfalls, I even managed to get the drone up in the air for some aerial shots. Upon arriving at Easter Corrie we were treated to some brown hares who are incredibly comfortable with human presence. I'll leave it at that but here are a few shots of the day courtesy of George Lambert, Evie Lewis and myself. Hopefully tomorrow we'll have a load of red squirrel shots along with any wildlife that the other morning party manage to catch! Much love, thanks for reading. Cairngorms MNHP 2018 - The Journey.